It's been a while- almost 5 months since I last blogged, wow, how did that happen??? I have been sewing though, and staying busy at the shop and at home. This spring I started making blocks for the Smitten quilt (by Lucy Kingwell). I am a slow starter, I know... My plan is just making a couple of blocks now and then- no rush. I am machine piecing the blocks, and really enjoying it. At Quilt Market last October I fell in love with the Octagon Shimmer Quilt by Jennifer Sampou, and after the pattern and fabrics have been sitting on my cutting table for a while I decided it was time to get started. 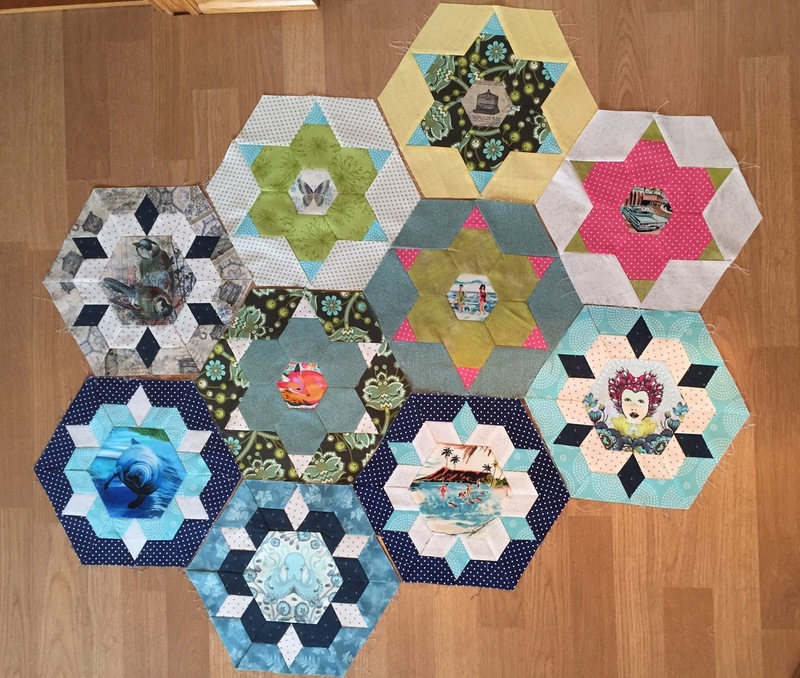 I LOVE making these blocks- they are pretty quick to sew, and it is so much fun seeing the pattern come to life when I puzzle the half blocks together! This summer my husband and I went to Italy for our vacation, and for the first time it was only the two of us! The kids are not kids anymore, and had plans on their own.... We stayed in Cortina d'Ampezzo for a week, and had lovely hikes every day. The picture is taken by Lago di Sorapis, a lovely lake in the Dolomites. The color of the water was just incredible! We hope to come back there again one day! Well, I don't know if anyone is still reading, but if you are- thank you for stopping by my extremely neglected blog! I promise it won't be five months until my next blog post! Hello! Lovely to see a post from you. 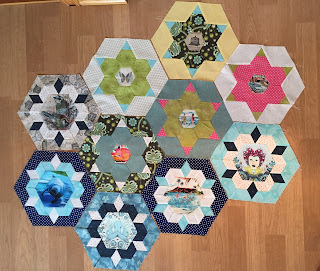 I love your English paper-pieced quilt blocks, it's looking fabulous. Definitely reading Anne Heidi! What a lovely holiday you've had... be careful to not get too many of the Ikea trolleys! !